Large-scale excavations and research of sites in the city center have unraveled the stages of Beirut's growth since the Bronze and Iron ages. Solidere supported the rescuing and preservation of this heritage and financed the teams working under the supervision of the Directorate General of Antiquities (DGA). The ancient Tell of Beirut, north of Martyrs' Square, constituted the fortified center of the city during the Canaanite, Phoenician, Persian and Hellenistic periods. Starting in the sixth century B.C., urban growth took place outside the fortified center (Acropolis) and extended as far west and south as today's Hotel District and Amir Bachir Street. Hippodrome, a chariot race with seats built on platforms cut out of the surrounding hill’s rock-face, and a series of building annexes. Byzantine Beirut followed the Roman urban topography as indicated by remains of residential and commercial quarters. The celebrated Law School, founded in the early third century A.D., has still not been unequivocally located in the Nejmeh area. From Crusader and Mamluk Beirut, a ditch and foundations of the medieval fortification walls were found in the Souks, parallel to Patriach Hoyek Street, as well as the watch towers, the Bourj, to the southeast of Martyrs' Square. The Ibn Iraq al Dimashqi shrine, in the Souks, is the only surviving Mamluk site in Beirut. The ancient Tell revealed part of the Crusader Castle. From the Ottoman period, excavations revealed a series of ancient harbor walls to the north of the Souks, between Khan Antoun Bey and the Majidiya mosque. Research has continued on archeological sites in public spaces, development lots or built lots under restoration. The documentation, digitizing and evaluation of the results provide data for a new synthesis of Beirut’s urban history. The latest historical insights are integrated in the information panels of the Heritage Trail. Around 2500 B.C., Canaanite Biruta was a small town, overlooking a natural bay where ships sought shelter. During Phoenician times, the city established two harbors and extended trade links throughout the Mediterranean and beyond. In Roman times, the sacred and administrative center was relocated from the Tell to the Forum, beneath today’s Etoile Square. In the Umayyad period, the northern part of the Tell regained strategic importance with the construction of fortifications overlooking the harbor. The fort, transformed into a castle in the Crusader period, was fought over for centuries. Shelling by the Russian fleet in 1827 and the British fleet in 1840 gave the final blow to the damaged castle which was never rebuilt. Archaeologists’ discoveries have left their marks in the urban design of the area, and remains were integrated within Castel Square and Belvedere Park landscape. The City History Museum, to be the starting and ending point of the Heritage Trail, will celebrate major finds and bring to life the story of the growth and development of the city from ancient times to the recent past. Beirut Port originated as a natural harbor, protected by the Ras Beirut promontory. From about 2500 B.C., inhabitants of the Tell worked the bedrock to create the first harbor facilities, allowing small boats to be pulled ashore. In the Canaanite and Phoenician periods, two harbors were formed from rocky inlets near the ancient Tell. Both still existed in Hellenistic times. Roman engineers enlarged the western basin with concrete seawalls, and the harbor extended halfway into the modern Foch-Allenby district. In the 1830s, Ibrahim Pasha initiated the first harbor project by creating an enclosed basin for lighters, next to the harbor’s southern quay. In 1887, Beirut Municipality obtained from the Ottomans permission to enlarge and modernize it. The resulting Ottoman Wall that enclosed the First Basin and the previous harbors was a significant engineering feat in its day. Under the French Mandate, a new jetty extended the Ottoman Wall another 800 meters into the sea, thus creating the largest harbor in the Eastern Mediterranean. Throughout the 20th century, Beirut kept its monopoly over maritime transit trade, while two more basins were added to the harbor complex. Roman Berytus had four major bath complexes (thermae) that were meeting places for all citizens, the remains of the current Roman Baths are located between Banks and Capuchin streets. The bathers moved from warm to hot baths, through rooms of varying temperatures. 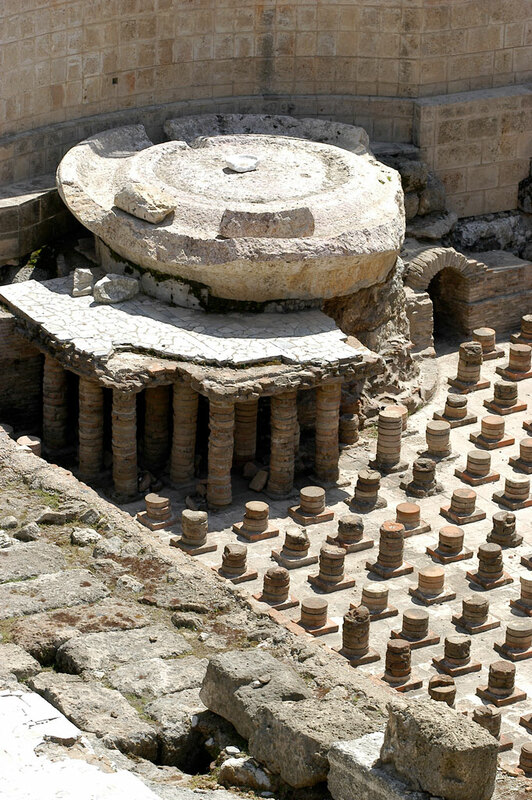 Located under the floor, the heating system (hypocaust) allowed the air, warmed by wood fires in adjacent vaults, to circulate between pillars of terracotta disks heating the marble floor. Water from the boiler fed the marble-tiled pools in the hot room (caldarium) and a large stone basin (labrum) contained cool water for the bathers’ use. Usually, the bathing ended with a body massage of therapeutic oils. The high vaults also accommodated performances of jesters and musicians. Today, the open space around the restored Roman Baths is landscaped with terraces reconstituting the sights and scents of ancient and Mediterranean gardens. The Roman Baths are a favored meeting place for people of all ages and for open-air events. Large crowds are drawn to the popular international concerts that it hosts during the Music Festival which is held in Beirut each summer together with several European cities. Excavations in the Wadi Abou Jamil area yielded vestiges of the ancient Hippodrome where chariot races took place, as well as the Theater where plays were performed and gladiators fought. The first phase Hippodrome was 42 m wide and they were widened to 88 m at a later stage. Remains of the rows of starting gates of both phases were built in a slightly concave alignment ensuring equal distance for all chariots to the beginning of the spina, or central barrier. The site located between Martyrs’ Square and Maarad Street axes, is an area of archeological ruins revealing some of the complexity of Beirut's rich cultural history. It is surrounded by different places of worship. Following a landscape competition, the Garden of Forgiveness is envisioned to be a place of calm and reflection, of understanding and tolerance. The Cardo and Decumanus Maximus, the two main streets of Roman Berytus, were discovered here. Their shaded colonnades became busy markets on festival days. At other times, the streets would have been frequented by Law School students and citizens passing to the Forum or visiting temples and churches. During excavations, a sacred platform dating from Phoenico-Persian times was found below the crossing of the Cardo and Decumanus Maximus. The Mamluk-Ottoman layers revealed the sites of various religious cults within a network of narrow alleys. In the late 19th century, straight shopping streets replaced the alleys, while the sites of religious worship were enlarged and became prestigious monuments. Nouriyeh chapel, once a place of worship attended by Lebanese citizens from various confessions, was rebuilt as a stand-alone chapel on its original site, now overlooking the Garden of Forgiveness. 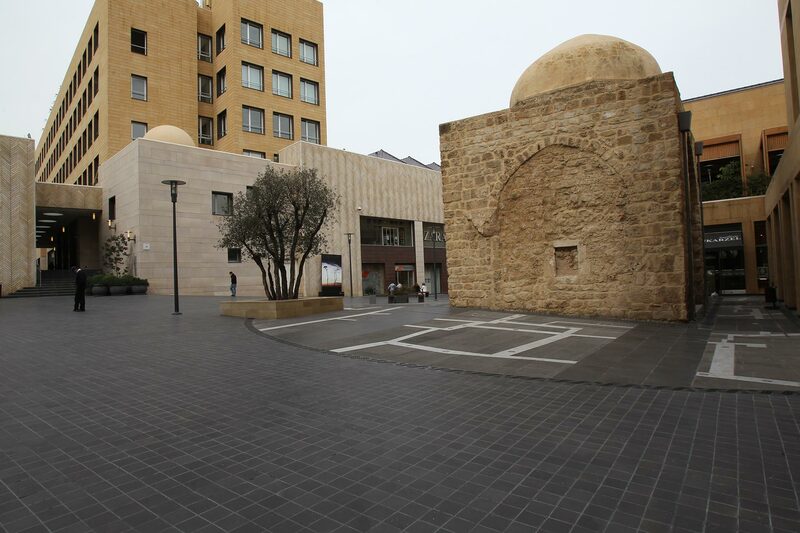 Beirut Souks reconstruction revives aspects of the ancient street network that stems from pre-Roman times. The conservation and consolidation of the Phoenico-Persian Quarter and the Moat and City Wall were completed. Elements of the ancient harbor walls are to be incorporated in Khan Antoun Bey Square. In the 6th century B.C., a Phoenico-Persian quarter built on the site overlooked the harbor. Housing blocks created an orthogonal street plan that survived for centuries and is still present in the alignment of Souk Tawila. The Souks area with its shopping colonnades and villas prospered during Romano-Byzantine times, until the 551 A.D. when the earthquake destroyed it. Archeologists have suggest the 9th century for the City Wall and Moat construction. Both wall and moat were built atop the Phoenician cemetery across the Phoenico-Persian ruins. In the early 1900s, the wall had been dismantled and Souk Jamil was built over the backfilled moat. When Emir Fakhreddine revived the silk industry in the 17th century, a large part of the Souks area became a mulberry plantation. The development of the harbor in the second half of the 19th century led to several changes; in 1853, a trade center planned as a caravanserai – Khan Antoun Bey – was built to house foreign consulates, merchants’ offices, shipping agents, banks, and a post office. A small domed building is all that remains today of the late Mameluk Zawiya (prayer corner) Ibn Iraq. The arches of the standing building once opened to other rooms and courtyards. From the late Ottoman period through the French Mandate years and well into Lebanon’s independence, the souks of Beirut were the main shopping destination for a multitude of customers. With their narrow streets, covered alleys and popular venues, the souks flourished until the outbreak of the Civil War in 1975. In the vicinity of Riad El Solh Square, more burials spanning the Umayyad to Ottoman period confirm that the site, first settled in the Roman period, was to become a cemetery after the city wall defined the open area just outside the city gates, Bab Dirke and Bab Yaqoub. On Nejmeh Square beneath the St Georges Orthodox Church lay the remains of a crypt which was used for various religious rites during the ages. In Saifi, near the Ring Road and the Armenian Catholic Church, the remains of an enclosure wall and tower, built in the early years of the Roman colony Berytus, were exposed, documented and are scheduled to become part of the landscape of the construction project on the site. The integration of the discoveries in a lot in Marfaa at the edge of the ancient Tell is also under study. In Mina El Hosn, near Starco, large mosaics forming part of a 15-room first century Roman villa were unearthed, documented, lifted and transferred to the National Museum.